Have you had issues in the past with traditional Pocket Squares? Have you been one of those men who spent the day fiddling with your traditional Pocket Square?...And it was still not perfect? Problem solved!! Pocket Squares Miami take all the guess work out. Our Pocket Squares look perfect all day each and every single time you wear them. Each Pocket Square is Pre-Folded and Sewn on a durable card that can be adjusted to fit perfectly in every suit pocket. MADE IN SUNNY MIAMI...EACH POCKET SQUARE IS CUT, SEWN & IRONED BY HAND. Same day Shipping if ordered before 1pm Eastern Time. Our squares are perfect for business, groups, and weddings. 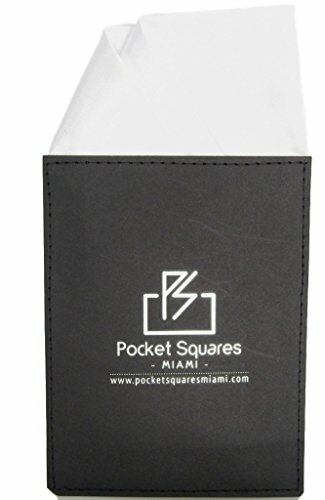 Simply stated "They are a perfect fashion accessory for any occasion"
If you have any questions about this product by Pocket Squares Miami, contact us by completing and submitting the form below. If you are looking for a specif part number, please include it with your message.